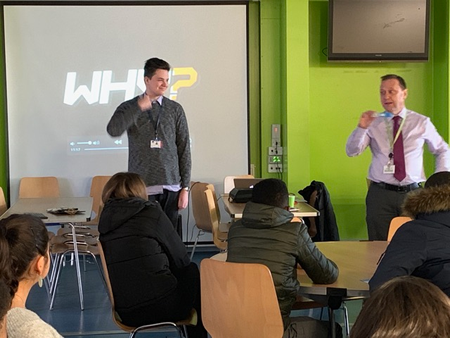 The presentation was led by a Northamptonshire Police officer, who has first-hand experience of car accidents and the consequences if you are caught driving dangerously. Students were asked to identify factors that most commonly lead to serious car accidents, known as the ‘fatal four’: these included not wearing a seatbelt, driving under the influence of drugs or alcohol, using a mobile while driving and speeding. A brave volunteer (Luke) was also given a drug test during the discussion on drink and using drugs whilst driving - I’m please to say he came up as negative, and had not been drinking that morning or taken any other substances! The officers also explained the existing driving laws in place in the UK, such as who is responsible for seatbelt wear and new drug testing laws. Students in year 13 will have workshops later in the week where they will learn more about driving safety.